Game of Thrones has a message for you and your difficult relatives if you are getting together for dinner this weekend….Let’s take a lesson from Game of Thrones and Elmo! AC & Kelly LOVE this! Way to rock an April Fools Prank! From AC & Kelly in the Morning this morning…..
We have had tons of calls for Psychic Eileen! Everyone wants to know how to get in touch with her…. Enlightening….a guidance/awareness level for your life….. If you would like a private reading…. (330) 638-4259. “I love my job. I love the pay! Wow! Today’s Thought for the Day……..
It’s Black History Month…..today was nothing short of amazing…..in case you missed it…. If you’re always late to stuff, here are five strategies that can help . . .
1. When you estimate how long it’ll take to get somewhere, always round up to the nearest 10. Like instead of saying, “It’ll take 14 minutes to get there,” assume 20 minutes. Then you have a little wiggle room. 2. Learn to be okay with waiting. People who are never late to stuff tend to spend a lot of time waiting in their car. Once you’re parked, you can read, listen to the radio, or waste time on your phone. And you’ve got nothing else to do, so it’s guilt-free. 3. Buy a wall clock. And put it somewhere you can see it while you’re getting ready. Or start wearing a watch. The point is it’s too easy to lose track of time if your only clock is the one on your phone. 4. Time yourself. Like if you’re always late for work, maybe you’re just not giving yourself enough time in the morning. Try using the stopwatch on your phone tomorrow to see how long it really takes to get ready. Then adjust your routine if you need to. 5. Stop making excuses, like you’re just “really busy.” If you’re ALWAYS late, it’s not because you’re too busy. It’s because being on time isn’t truly a priority for you. And once you make it a priority, you’ll be on time more often than not. What’s the Best thing to serve for the big game? Delish ranked them by state…. What food are people in every state Googling the most? The top answer is Buffalo chicken dip, which is number one in eight states. The big game Sunday is such a big EATING day that it’s kind of like . . . well . . . the perfect day for eating. But NOT the states whose teams are IN the big game . . . they have some of the worst snacks of all. California’s top food is baked chicken breasts . . . and Massachusetts’ is gluten-free pretzels. Ouch. Here are the full results for every state……. Pennsylvania, chicken wings . . . Rhode Island, seven-layer dip . . . South Carolina, turkey chili . . . South Dakota, cupcakes . . . Tennessee, cake . . . Texas, spinach dip . . . Utah, bacon-wrapped smokies . . . Vermont, lasagna . . . So just to be clear….Ohio is Buffalo Chicken Dip and Pennsylvania is chicken wings….two of our favorites!!! So see you at the hottest parties!!! The Christmas that went viral. Today Is the Loneliest Day of the Year??? According to the experts….but WHY???? Bad news and good news for you. The bad news: Between the cold, the dark, and the holiday stress, you probably feel pretty ALONE and MISERABLE today. The good news: Um . . . other people are just as miserable? According to a new study, TODAY (11/27/18) is the loneliest day of the year. And the three main reasons are: It’s dark outside . . . the weather is awful . . . and people are struggling to budget for Christmas. But that means that tomorrow will be BETTER! And at 8:10am tomorrow (11/28/18) on AC & Kelly…the TOP 5 ways to be HAPPY! Are you annoying people at work without even realizing it? See if you have any of these bad work habits . .
1. Eating smelly food at your desk. Some of the worst offenders are hard-boiled eggs, broccoli, tuna, and seafood in general. 2. Asking too many questions. Asking questions is fine. Just try not to ask too many work-related questions, or you’ll look like you can’t figure stuff out on your own. And asking a lot of PERSONAL questions is risky for other reasons. 3. Being a slob. A messy desk is one thing. People might judge you, but probably won’t hate you for it. Just don’t be a slob in common areas, like the kitchen. It makes you seem irresponsible, arrogant, and immature. 4. Interrupting people all the time. You can definitely interject. But in general, make sure you just respect people enough to let them finish a thought. Otherwise, it looks like you don’t have good judgement, or you’re impatient. 5. Talking to people in the bathroom while they’re in one of the stalls. At the sink is fine. And the urinal, still fine. But if they’re in a stall, leave them alone. It just feels awkward and intrusive. Poland Village – Wednesday, October 31, 5 pm – 7 pm. Niles Nazarene Trunk or Treat – Wednesday, Oct 31, 5-730 pm, 1822 Niles Vienna Rd. Sandy Lake Borough – Wednesday, October 31, 4 pm-6 pm. Make sure kids’ costumes are loose-fitting and flame-resistant. Avoid masks that obscure vision. Young children should always be accompanied by an adult or older sibling. Carry a flashlight and put reflective tape on costumes so children can be seen. Accept only factory-wrapped treats. Avoid eating homemade treats made by strangers. Thank you to our media partners for the compiled list. If you have an event to add please contact us. A bunch of divorce lawyers came up with a list of ten questions they say every couple should talk about before they get married. If you don’t answer yes to all ten, don’t worry. It doesn’t mean you’re totally wrong for each other. But it might help you find things to work on. Here are the ten questions . . .
1. Are you a good fit for each other? Which is a broad question. But just think about it. 2. Is your relationship grounded in friendship? 3. Do you try to see the best in each other? 4. Do you both have realistic expectations of each other? 5. Do you generally want the same things in life? So, things like kids, or a nice house. 6. Can you raise issues with each other, and talk them out? 7. Do you keep things exciting? 8. Are you both committed to working through tough times? 9. Would you pull together in hard times? Which is kind of the same as the last one. 10. Do you each have your own support group, so you don’t just rely on each other? Join AC & Kelly at the Sight for All United at the 3rd Annual Eye Ball of the Mahoning Valley, Saturday, October 13, 2018 at the DeYor Performing Arts Centre in downtown Youngstown. Want to bid on some AMAZING auction items? Green Township: Oct. 27, 4:00-6:00PM Community party-Costume judging 6:30-7:30 donuts, cider, treat bags for participants. From AC & Kelly this morning…How to fall asleep in TWO MINUTES????? Kelly has tried it for the past week….What happened? The U.S. military came up with a method years ago that supposedly helps you fall asleep in two minutes. A book in 1981 revealed a secret method the U.S. military supposedly came up with that can put you to sleep in TWO minutes. Here are the five steps you need to follow. 5. Picture yourself in a calm location, like lying in a canoe under a clear blue sky. . . or lying in a black velvet hammock in a dark room. And if you’re still not asleep, repeat the phrase “don’t think, don’t think” over and over again in your head. 83% of Men Pee in the Shower . . . Do You?…or……Do you know someone who does? A new survey asked men about what they REALLY do when they’re in the shower, and it uncovered some unexpected truths. Check it out . . .
1. 83% of men pee in the shower. 2. 40% brush their teeth. 3. And 20% sometimes only wash their, quote, “important parts” and not their entire body. The survey also found about one in three guys say sometimes they go to work without taking a shower. Eeewwww…. Were there rules for YOU when you got married?How about Meghan Markle?Some say that life as she knows it has officially ceased to exist. From galas, balls, public engagements, teas and meetings with the Queen Elizabeth II, Meghan is now living a life of royal duties. While many may see tiaras, gowns and castles when they look at Meghan, the realities of living as a royal and essentially a life of service to the British monarchy involves a very ordered and highly scrutinized existence, filled with a seemingly endless amount of arbitrary etiquette that should not be crossed. From entering a room in a specific order to making sure not to cross her legs or keeping her skirt a certain length, Meghan will need to adhere to a slew of royal rules to avoid major no-nos or faux pas in order to stay in society and the Queen’s good graces. 1. No Selfies: During her first official event with Prince Harry, Meghan revealed that she would no longer be able to take selfies with fans after a couple asked her to pose.”We’re not allowed to do selfies,” she told the duo, reports the Daily Mirror. The rule was created to encourage people to make eye contact and make conversation with royals, instead of turning their backs to them (a huge no-no) to take a selfie. 2. No Autographs: She may have some Suits superfans in her past, but these days the new royal isn’t allowed to sign autographs under any circumstances. From here on out it’s only royal documents and in some rare cases—visitor’s books, according toRoyalUK.com. 3. No Social Media: Meghan’s not allowed to have her own social media page, which is why her own lifestyle blog and Instagram, The Tig, went dark last year. 4. No Dark Nails: According to sources at OK! magazine, Royal Family members are prohibited from wearing dark and colored nail polish. Meghan wore the Queen’s favorite color, Essie’s Ballet Slippers, to the Royal Wedding, and we have a feeling that color is here to stay. 6. Curtsy Time: The queen expects female family members, including Kate Middleton andCamilla Parker Bowles, to curtsy when they enter a room in her presence, even when it’s an informal occasion, which means Meghan better get used to the curtsy. If she is at an official event, Meghan must also curtsy to anyone who outranks her title. 7. No Miniskirts: The queen disapproves of hemlines higher than an inch or two above the knee. Regular female visitors such as Kate, Camilla, Princess Beatrice and Princess Eugenie are already aware of the fashion stipulation. If Meghan hasn’t already ditched her little black dresses or her minis, time to throw them out! 8. None of that Crossed-Legged Business: It’s frowned upon for Royal Family members to cross their legs, according to an expert for Hello! You’ll never see Kate Middleton crossing her legs anywhere other than at her angles. Kate often does a side-by-side move known as “the Duchess Slant,” which Princess Diana utilized. Meghan better be working on her Duchess of Sussex slant! 9. No Wedges: The Queen apparently DESPISES wedge shoes, says Vanity Fair. So get rid of ’em, girl! 12. No Room Raiding: There is a strict code of conduct for how to enter a room when your are with the royals. Here’s the royal order: Queen Elizabeth, Prince Philip, Prince Charles, Camila, Prince William, Kate Middleton, and then most likely, Prince Harry and Markle, according toReader’s Digest. 13. Don’t Eat Before the Queen or After the Queen: Markle should not begin eating her meal until the Queen has started hers, StyleCaster reports. The former Suitsstar also needs to keep her eyes peeled—for when the Queen stops eating, everyone must stop eating, even if there is still food.Diane Gottsman, who wrote Modern Etiquette for a Better Life, told Bravo that there are strict rules when eating with the leading lady of England.”No one should start eating before the Monarch and no one should carry on eating after the Monarch has finished,” Gottsman said.14. No Sleeping ‘Til the Queen Sleeps: If Markle stays at the Queen’s house, she’s gotta stay up until QE2 falls asleep, so says the Daily Beast. Apparently it’s considered bad form to call it a night before the monarch. Luckily, the Queen isn’t known for throwing all night-ragers so Markle likely will be able to hit the hay before midnight. 15. Do Not Pass Go: Monopoly is not allowed. According to Reader’s Digest, in 2008, the Leeds Building Society gave the Duke of York Prince Andrew the game of Monopoly to which he responded, “We’re not allowed to play Monopoly at home. It gets too vicious.” Looks like all of Meghan’s get out of of jail cards have been used up.16. No Pinkies Out: Tea time is an important time for royals. Etiquette expertMyka Meier told People that the correct way to drink tea is to use your thumb and index finger to hold the top of the handle, while the middle finger supports the bottom. You should also sip from the same spot the entire time so that the rim doesn’t get lipstick stains. If you are a coffee drinker, you should loop your index finger through the handle. But beware—no pinkies out. Even the royals draw the line somewhere. 17. No Shellfish For You: It’s an ancient royal tradition to say no to shellfish in order to avoid food poisoning. While the royal family doesn’t always adhere to that rule, Queen Elizabeth still does. Let’s be honest, the 92-year-old loves her traditions. Since it’s only a few days in, it’s still unclear if Meghan will be allowed to feast on the exoskeleton-bearing aquatic invertebrates now that she’s no longer a mere mortal. But perchance she’s already thrown out her hunger for molluscs, crustaceans, and echinoderms, along with those Godforsaken wedges.And of course, there are sooooo many more!Good luck, Meghan! We know you’re up for the challenge! What’s the Best Candy to Get in an Easter Basket? Easter candy is like Halloween candy but without having to do ANY walking to get it. So in a way, you should just be happy with whatever you get. The website Thrillist just put together a ranking of Easter candies from the best thing to get in your basket to the worst. And here’s how the rankings shook out . . .
A new study found the top 10 deal breakers that are most likely to immediately end a date. They feel like they really SHOULD be common sense, but clearly people just keep doing them . . . so consider this a refresher course. Which of these have happened to you on a date?. . .
1. Saying something racist or intolerant. 2. Being inconsiderate or rude. 5. Making it clear you’re not over your ex. 10. Being flaky or showing up late. The survey also found the top three things that AREN’T deal breakers: Being good looking . . . being rich . . . or being a little bit shy or quiet. Psychic Eileen was on the air with AC & Kelly giving lots of insight. If you want to book a private reading, call Eileen at (330) 638-4259. OMG!!! Seriously! We were so excited when we heard that Bruno Mars had an upcoming special on CBS….Imagine how we felt when JDub asked if we would be interested in hearing about it from Bruno!!!!! Missed it? Here you go! Psychic Eileen in the House!!! So how do you contact her? Contact Psychic Eileen at (330) 638-4259. Someone poured through ten years of sales data to find out which type of Halloween candy each state buys the most of. So it’s really what each state HANDS OUT the most. And the overall favorite is CANDY CORN????……. CANDY CORN!!! It’s the #1 candy in six states…and it’s cheap. Sour Patch Kids are next, then M&M’s, Milky Ways, Reese’s Peanut Butter Cups, Snickers, and Tootsie Pops. Candy Corn took the top spot in six different states . . . Alabama, Indiana, Michigan, New Mexico, Rhode Island, and South Carolina. Next is Sour Patch Kids. It’s #1 in five states . . . Illinois, Maine, Massachusetts, Nebraska, and New York. Five different candies took the top spot in four states . . . M&M’s, Milky Ways, Reese’s Peanut Butter Cups, Snickers, and Tootsie Pops. Skittles and Starburst are the top choice in three states each. Here are a few stand-alones that are only first in ONE state: Almond Joys are #1 in Connecticut . . . Hershey’s Kisses are #1 in Nevada . . . Lemonheads are #1 in Louisiana . . . 3 Musketeers are #1 in Mississippi . . . Life Savers are #1 in Delaware . . .
Georgia buys more Swedish Fish than any other Halloween candy . . . Alaska is the only state where Twix is #1 . . . and Montana wins for LAMEST Halloween candy. The one they buy the most of is GUM, specifically Double Bubble. Two surprise SNUBS were Butterfingers and Kit Kats. They came in 2nd or 3rd in a few states. But they’re not #1 anywhere. Check out the Top 3 candies by state…..
We’ve seen a few lists like this before, and #1 is always the same. Researchers recently gave people a list of 50 different things we take for granted every day. And they had to rank them according to how important they are. Here are the top 10 luxuries we can’t live without . . .
1. The Internet. Almost everyone put it at the top. 4. A washer and dryer. 5. A nice, big mattress. 7. Beauty and skincare products. 10. Eating out at restaurants. A few luxuries people said they COULD live without are really nice towels . . . flying first class . . . tickets to sporting events . . . having food delivered . . . and paying for someone to clean your place. During dark times, it feels like it’s going to be tough to find ANYTHING to be happy about. Which is why this is so timely . . . because it’s a reminder that we can find a lot of little happy moments in day-to-day life. A new survey found the LITTLE THINGS that make us happy. Here are the top 10 . . .
1. A kiss and a hug. 4. Petting your dog or cat. 5. Getting a good deal. 8. Hearing from an old friend. 9. Doing a good deed. 10. Having some lazy time where you just relax and do nothing. Here’s a dangerous topic for dinner tonight. Married couples were asked what they’d CHANGE about each other if they could. The average woman would change four things about her husband. And the average guy would change SIX things about his wife. Here are the top ten for both, starting with things women would change about their husband . . .
1. They’d make him less grumpy. 35% of wives agreed with that one. 2. They’d make him listen more when they talk, 30%. 3. They’d get rid of some of his bad habits, 25%. They didn’t say which ones. 4. They’d make him more appreciative, 25%. 5. They’d make him help more around the house, 21%. 6. They’d make him eat healthier, 14%. 7. They’d get him to spend less money, 13%. 8. They’d make him cut down on the drinking, 13%. 9. They’d make him always put the toilet seat down, 12%. 10. They’d make him more emotionally intelligent, 12%. Now here are the top ten things men would change about their wives . . .
1. They’d make her more affectionate, 23%. 2. They’d make her happier in general, 22%. 3. They’d get her to be more adventurous in bed, 20%. 5. They’d make her more appreciative, 17%. So that one was in the top five for both. 6. They’d make her live a healthier lifestyle, 16%. Which kind of sounds like a nice way of saying LOSE WEIGHT. But getting her to stop being OBSESSED with her weight also made the top 20. So who knows? 7. They’d want her to have more energy, so she’s not tired all the time, 16%. 8. They’d dress her in sexier clothes, 16%. 9. They’d make her spend less money, 14%. The good news is it looks like most of us are willing to stick it out even if the person DOESN’T change. Only 13% of the people in the survey said they think they might have ended up with the wrong person. So this morning…AC decided to see if he is an “average mammal”…. How you can become a Hero with the American Red Cross?…Training classes available NOW! Do you watch the disasters on the news and wish you could help in even some small way? Do you feel the need to do more? Then the American Red Cross wants you! They are doing training to help you become a volunteer for the American Red Cross. 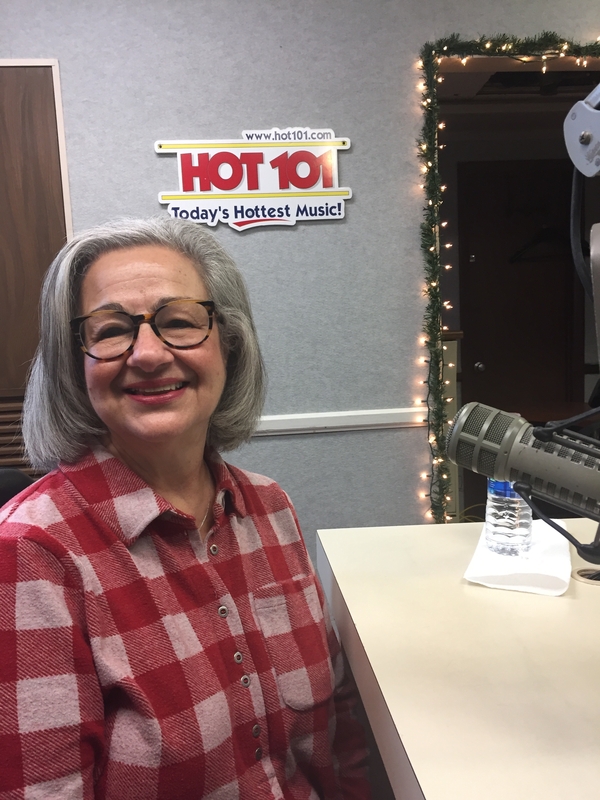 Karen Conklin was on the air with AC & Kelly explaining the new program. Training is going on NOW. Call (330) 392-2551 to see how you can help! You gotta love people who stick to their beliefs in a life-or-death situation. 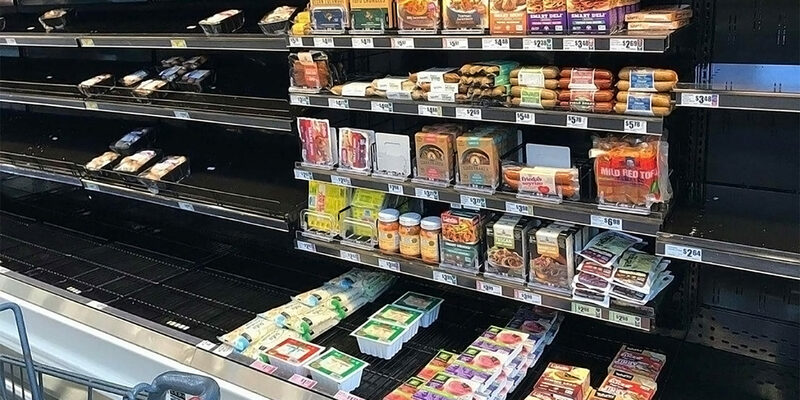 There’s a photo that’s going viral from a grocery store in Houston that shows empty shelves with one exception: They’re still fully stocked with all of their VEGAN MEAT SUBSTITUTES. It seems that when people were facing possible starvation or eating vegan meat, they all went with starve. What would you leave on the shelves? A new study found the food that every state HATES more than anyone else. Some of the best ones are Montana hating pumpkin spice anything . . . . Virginia hating pizza that’s had the grease dabbed off with a napkin . . . and New Jersey hating gas station wine. There’s a dating app called Hater that matches people up by the stuff they say they HATE. And they just analyzed their data to figure out what FOOD people in every state disproportionately hate more than the rest of the country. The results feel pretty random, but still good. Here are some of the highlights . . .
1. Montana . . . pumpkin spice anything. 2. Vermont . . . spray cheese. 3. Virginia . . . pizza that’s had the grease dabbed off with a napkin. 4. Maryland . . . the corner piece of a brownie. 5. California . . . Chick-fil-A. 6. Texas . . . well done steak. 8. Wyoming . . . gluten free everything. 10. New Jersey . . . gas station wine. You’ve probably heard about the eclipse happening on Monday. And if you’re hoping to take some pictures of it, here’s a quick guide on how to do it with your phone . . .
1. Use a solar filter. To take pictures during the eclipse, you need to cover your phone’s lens with either a solar filter or your eclipse glasses. Regular sunglasses will NOT work. And only take the filter off if you’re lucky enough to be in the path of totality, when the sun is completely covered. 2. Use a tripod to keep your phone stable. To minimize any small movements made by your hands. 3. Take pictures of stuff around you. If you don’t have a solar filter, eclipse glasses, or a tripod, take pictures of the stuff going on around you during the eclipse . . . like pets, and other people looking up at the sky. 4. Practice this weekend. Practice by taking photos just after sunset to get an idea of what the light levels will be like during the eclipse. 5. Keep your expectations in check. Let’s be real . . . cameras on phones were meant for selfies and other quick shots. So don’t expect AMAZING eclipse photos from your smartphone. Recap: Use a solar filter or your eclipse glasses . . . use a tripod to keep your phone stable . . . practice taking pictures just after sunset, when the light will be similar . . . and don’t expect the photos to turn out amazing. Have you ever lost your ring??? An 84-year-old woman in Canada lost her engagement ring while she was pulling weeds in her garden back in 2004. And her daughter-in-law just found it embedded in a CARROT. There’s an 84-year-old woman near Edmonton named Mary Grams who lost her engagement ring while she was pulling weeds in her garden in 2004. She searched for a few weeks, but couldn’t find it. So she bought a replacement ring without telling her husband. She says she was too embarrassed to tell him about it. But now all’s right with the world again. Because Mary’s daughter-in-law was picking vegetables from the same garden recently . . . and FOUND the ring embedded in a CARROT. It looks like the carrot started growing through the ring, and got too big for it. So the middle is a lot skinnier, and the ring is wrapped around it. The only person Mary told about it back then was her son. So he remembered the story, and knew it was hers as soon as his wife showed it to him. Mary’s husband passed away about five years ago, so she’s pretty excited to have the ring back. Apparently he never found out she lost it. But she says if he was still around, he’d think the whole thing was hilarious. By the way, this isn’t the first time something like this has happened. Just last year, a guy in Germany found his wedding band three years after he lost it gardening. 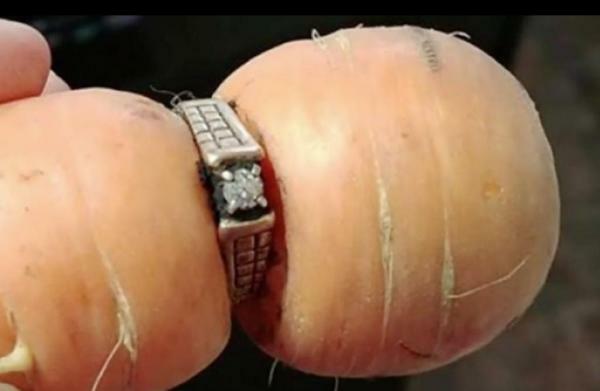 And that ring was ALSO lodged in a carrot. Do you have one food…that you just can’t have “one”….you don’t stop until you reach the bottom? What’s the Hardest Snack to Stop Eating Once You’ve Started? More than 2,700 people recently took a survey to find out the hardest foods to stop eating once you’ve started. And salty stuff like potato chips took the top spot. Here are the top five . . .
(and did anyone other than us notice that Ice Cream isn’t on the list? Have other parts of the country never heard of Handel’s????? 1. Chips, pretzels, and other salty snacks. 35% of people said they have a hard time stopping once they’ve started. 2. Candy, not including chocolate, 18%. So stuff like Skittles and Starburst. 3. Chocolate, 12%. That includes candy bars, like Snickers and Butterfingers. 4. Crackers and other bread-based snacks, 11%. So things like Cheez-Its. What’s HOT in the Valley? Looking for the best events for the 4th of July Weekend? We’ve got you covered. Great events all over the Valley! River Rock at the Amp features Bruce in the USA on Saturday, July 1 at 8:30 pm. Gates open at 5:00 p.m.
show is Tuesday, July 4th, 2017 8:00 p.m.
McDonald Fireworks are July 1 about 11:00-11:15 p.m. The 44th Annual Ox Roast is June 30, July 1, and July 2 starting at 10:00 a.m.
Niles Parade is Sunday, July 2, 1:00 p.m.
Don’t miss Harry Stevens Hot Dog Day/Fourth of July Celebration, hot dog eating contest, wiener dog race, helicopter rides, Miss Niles competition. on Sunday, July 2 from 12 until 9 p.m. on State Street in Downtown Niles. Newton Falls Fourth of July Parade is July 4th at 10 a.m. Check out the “Party in the Austintown Plaza”, Sunday, July 2 beginning at 4 p.m. Great bands/live entertainment at the Austintown Plaza, Mahoning Ave.
Air National Guard Band of the Northeast on Saturday July 1st, 8 – 11 p.m.
Canfield July 4th Parade is on July 4 at 10:10 a.m. Celebrate Poland 2017 Friday, June 30 at 3:00 p.m. to July 1st 1:00 at 6 p.m.
Friday, June 30 at 7 p.m.
Saturday, July 1 at 10 p.m.
Sebring 4th of July Celebration is July 4th 7 a.m. – 10 p.m. The Youngstown Fourth of July – Fireworks Celebration is July 4 10:00 p.m.-11:00 p.m.
are July 4th at 10 p.m.
East Palestine Fireworks on July 4 at 10 p.m.
2 p.m. to 6 p.m. – Car Show on Main St.
2.p.m. to 5 p.m. – Art Show “Through the Lens” at the Sans MOCO Gallery Fresh Grounds Main St.
We LOVE our ice cream….here in the Valley…we have some of the BEST ICE CREAM! But…what is your favorite flavor? And do you know the difference between Vanilla and French Vanilla? A new poll had people rank the best ice cream flavors, and we fully expected a BORING pick at #1 . . . either chocolate or vanilla. But apparently we’re NOT quite that boring . . .
More than 5,000 people voted online, and COOKIES AND CREAM took first place. Here are the top ten . . .
5. Strawberry. Neapolitan with vanilla, chocolate, AND strawberry came in 12th. 7. French vanilla. If they’d lumped it in with regular vanilla, it probably would have come in first. They’re different though. Real “French vanilla” ice cream has eggs in it. How would you like empower the young women in your life? Jennifer Gray from Compass was in the studio with a MAJOR announcement concerning this weekends “Wonder Woman” movie! She is looking for groups/individuals who would like to empower our girls….AND see Wonder Woman together for FREE! Interested? Call Jennifer Gray at Compass (330)782-5664. HURRY! Tickets are going fast! Check out some of the HOT events happening this weekend. Please go out and support our community by attending a service near you. Wear red, white and blue and remember our fallen soldiers this Memorial Day. Austintown Parade: Memorial Day parade begins at 10:30 a.m. at Marc’s parking lot at Mahoning Avenue and Idaho Road and will proceed to Austintown Fitch High School Veterans Memorial. A service begins at 11 a.m., sponsored by Austintown Memorial American Legion Post 301 and Austintown VFW Post. Main speaker will be Lt. Col. Rodrick A. Hosler, U.S. Army, retired. Beaver Township Parade: Memorial Day parade begins at 11 a.m. at 11999 South Ave, North Lima. Four World War II veterans, one from each service branch are all residents of Shepard of the Valley in Beaver Township. These vets will be co-marshals and escorted in two WWII era jeeps. Boardman Parade: Boardman Kiwanis will hold its 109th Memorial Day Parade and Service at 10 a.m. Participating groups will assemble at the Boardman Center Middle School at 9:30 a.m. All organizations who are interested to enter a float in the Parade are invited. If you are interested, please contact Stephanie Landers atBoardmanParade@yahoo.com. Mr. Gary Rhamy will be the Grand Marshall and featured speaker at the Parade and Memorial Service. Reverend Ash Welch of the Boardman United Methodist Church will give the invocation. Lt. Colonel Bill Moss, USAF Retired, will lead the pledge of allegiance and place a wreath in honor of our deceased veterans. Mark Luke of the Boardman Kiwanis will serve as Master of Ceremonies for the Memorial Service. The Boardman Spartan Marching Band will march in the Parade and provide music for the Memorial Service. Braceville Parade: The township will hold an observance at 10:30 a.m. at Braceville Christian Church. A parade featuring the LaBrae High School band and community groups will begin at 11 a.m. at the township park and conclude at the cemetery where there will be laying of wreaths, music and prayers. Campbell: A program at the Campbell Memorial High School monument will begin at 11 a.m. Remarks from Judge Patrick Cunning, Mayor William VanSuch and Campbell schools superintendent Mathew Bowen will be shared. Campbell High School Band will perform. There will be a firing squad and “Taps” will be performed. Refreshments will be served after the service at Legion Hall. Fowler Parade: The annual Memorial Day program will be at 10 a.m. at Fowler Center followed by a parade at 11 a.m. and services on the green by VFW Post 3521. A light lunch will be served after the service at the fire station. The Fowler Township Historical Society museum will be open as well. Girard Parade: The Girard Veterans Council will sponsor Memorial Day services at the Girard City Cemetery starting at 11 a.m. Pastor Rhonda Gallagher of Trinity Lutheran Church will give the invocation and benediction. Boy Scout Troop 40 will raise the flag and the Girard High School Band will play “The Star-Spangled Banner.” Auxiliary president of Army Navy Garrison 422 will place the wreath, escorted by senior Vice Commander of VFW Post 419, Gene Greathouse. The Gettysburg Address will be read by the valedictorians of the 2013 GirardHigh School graduating class, Benjamin Cario, Samuel Horne and Gia Mancini. Gina Martini, Heaven Clark, Nicholas Sherock and Jacob Ryser will each give a brief biography on a name on the War Memorial from various wars. Mayor James Melfi will give a few remarks. The Girard Veterans Honor Guard will give a 21-gun salute and Leslie Klock will play “Amazing Grace” on the bagpipe. Glenwood Memorial: American Legion Post 504, 2225 Glenwood Ave., will have a memorial service at 5 p.m. Keynote speaker is veteran Sonia Walton. Veteran Herman Adams will be honored at the service. A dinner will be served. Lake Park Memorial: At 11 a.m., a service at Lake Park Cemetery veterans’ plot will be led by Commander Donna Burford of American Legion Post 158. Main speaker will be Commander Jan Brown of Post 44. Ladies Auxiliary of Posts 3538 and 7538 will place wreaths. Ray Ornelas will present a POW/MIA tablet. Struthers High School band will furnish music, and Boy Scout Troop 101 will lead the procession. Lordstown Parade: The village will hold a service at 10 a.m. at the cemetery on Salt Springs Road. Refreshments follow at Lordstown administration building. Salem Parade: The Salem Memorial Day service will be held at 11 a.m. May 27 at Grandview Cemetery with Bob Sebo as speaker of the day. Salem’s 149th Memorial Day activities, sponsored by the Salem Memorial and Patriotic Association, will start with a free breakfast at 8 a.m. at the Memorial Building at 785 E. State St. for all veterans participating in the parade, hosted by the association. Weathersfield Memorial: Veterans of Foreign Wars Post 4192 will host a ceremony honoring departed comrades at 2 p.m. at Kerr Cemetery. Best Field Trip You took as a kid? AC & Kelly are looking for fun places to take the morning show on the road….a Field Trip! They LOVE doing their show on location because it’s like being on a field trip. School field trips are fun and educational for students…so why not a Morning Show?…..What was your favorite? Touring a local farm is a great way to learn about food production, different farm animals, and the hard work that goes into the food we eat. Students will have a great time while learning all the ins and outs of farm life. Local farms often give tours or welcome students because they realize the importance of educating our youth about farming and local produce. State capitols are rich in history and landmarks. They are ideal field trip locations because there is plenty to do within the confines of the state capitols. You can visit politicians, see museums, or take in historic landmarks. The possibilities in the state capitols are endless – not to mention students will love the excitement of the city. Museums offer a plethora of knowledge and entertainment for students of all ages. The great thing about museums is the variety of knowledge and subject matter that each museum offers. You will be sure to find something in the museum to relate to class subject matter. You can even spend more time in those areas to drive home key concepts. Planetariums are one of the coolest places to take a field trip too. I still vividly remember the time our elementary class went to the planetarium. The stars projected onto the huge dome paint a clear picture of the night sky free of light pollution. Students and chaperones alike will enjoy their time under the projected stars. Zoos are another awesome place to take a field trip to. The animals on display are from all over the world and they bring their own stories with them. The animals – big and small, will captivate students and get them excited to learn more on their own. Field trips are supposed to educate and inspire and the zoo can do exactly that. There is nothing quite like the art of theatre. Taking a group of students to see a play will be a life changing experience. Plus, the magic of theatre will certainly peak the interest of any student. Many flagship works of drama are still put on to this day, so students will be able to see Shakespeare, for example, come to life. Local factories give a glimpse into the manufacturing process, but they also show students the value in hard work and manual labor. Not all students will want to go on to college, so it’s good for them to see other trades and opportunities available to them. Factories that regularly set up tours normally have interactive aspects to them as well, so students will enjoy getting their hands dirty while learning about production. Solar Farms and Wind energy plants are becoming increasingly more popular and accessible to the public for tours. Renewable energy is extremely important and students would enjoy seeing the huge wind turbines or learning just how much goes into the set up and use of solar panels. This is a unique field trip that students will remember for years to come. Rope courses offer team building and bonding experiences unlike any other type of field trips. Students learn to work better together and problem solve their way through tough situations. Zip lines are also great because there’s nothing like experiencing physics from a real life perspective. Zip lines use gravity and exact angles to create the sensation of flying through the air. Pair this with a physics lesson and students will be engaged and excited to learn even more. Going on a field trip to participate in team building is fun and beneficial to the classroom environment. Team building exercises will create a better classroom morale and will even grow a sense of togetherness among the students. These types of trips also put students’ problem solving skills to work. They must work together to achieve a common goal. That’s a great skill to develop and practice often! Are These the 10 Most Re-Watchable Movies of All Time? AC has his favorites…Kelly has hers….but they didn’t even make the top list! We are all shocked at the movies that didn’t make the list!!!! What would you put on the list?…..
You probably have a handful of movies that you’ve watched over and over and over again . . . and will STILL pop in every now and then, or stop and watch if you catch them on TV. Ranker.com has a list of ‘The Most Re-Watchable Movies of All Time,’ and “Forrest Gump” is #1. A new survey found 70% of us plan to buy a Mother’s Day gift this year. We’ll toss down $58 on average. But 1 in 5 people think it’s hard to find a GOOD gift. So this might help take the guesswork out of it . . .
A bunch of moms voted on what the BEST Mother’s Day gifts are. The good news is you don’t have to get too creative. You could probably guess most of these. Here are the top five…. 1. Flowers. Which seems boring and cliché. But 48% of moms said that if they only get one gift this year, that’s what they want. 2. Dinner at a nice restaurant. 43% said it’s a great gift. And obviously they want you to go WITH them. Don’t just drop her off in the Red Lobster parking lot. 3. A gift card. 41% of moms said it’s a good Mother’s Day gift. But don’t just hand it to her. Put it in a card. And obviously pick a gift card for a place she LIKES. 4. Jewelry. 28% of moms said they’d like to get jewelry for Mother’s Day. And it’s a good gift for multiple people to chip in on. 5. Beauty products. 27% of moms said it’s a great gift. Just make sure it’s something she’ll use. If you’re not sure, then think about something like a Birchbox subscription, where she gets different stuff every month. Somebody Made the “Sgt. Pepper’s Lonely Hearts Club Band” Album Into a “Star Wars” Musical . . . and It’s Brilliant! Someone rewrote the Beatles’ entire “Sgt.Pepper’s Lonely Hearts Club Band” album to tell the story of the first “Star Wars” movie, then set it to clips from the movie and put it on YouTube . . . and it’s brilliant. Even the title is perfect: “Princess Leia’s Stolen Death Star Plans”. A YouTube channel called Palette-Swap Ninja took the entire “Sgt. Pepper’s Lonely Hearts Club Band” album by the BEATLES and changed all the lyrics to tell the entire story of the first “Star Wars” movie. And it’s BRILLIANT. It goes song-for-song, in sequence, and covers the move from beginning to end. It starts off with “Princess Leia’s Stolen Death Star Plans” . . . which is also the name of the entire project. From there, it includes songs like “With Illicit Help from Your Friends” (“With a Little Help from My Friends”) . . . “Imperial Holes” (“Fixing a Hole”) . . . and “Being from the Spaceport of Mos Eisley” (“Being for the Benefit of Mr. Kite”). Things even get a little trippy with “The Force Within You”, which is a take-off of “Within Without You”. Please help us spread the word! Wednesday May 3rd from 10am-6pm Bring your expired, unwanted, or unused prescription medication for safe disposal to: Geauga-Trumbull Solid Waste Management District, 5138 Enterprise Dr. Warren Ohio. It’s fast, easy, and anonymous! Just drive up and drop off. It’s that simple. Law enforcement officials will receive and destroy these medications…no questions asked! Why not just flush? Many pharmaceuticals are getting past our waste water treatment plants and getting into drinking water. An Associated Press investigation last year found that trace amounts of many prescription drugs are in the drinking water of 41 million Americans. Directions: Coming from Warren, go out Parkman Rd past N. Leavitt Rd. then turn left onto Enterprise Dr.
Coming from the Rt. 5 ByPass, take Parkman Rd toward Warren, make the first right turn onto Enterprise Drive. For more information call (330) 675-2765 ext 119. Todd Franko asked AC & Kelly about the upcoming Angels of Easter Seals Fashion Show/Luncheon. Tickets are still available (330) 599-5500. This the fashion event of the year! Perfect to take your mom, aunt, BFF, co-workers…. People Who Wake Up on this side of the Bed Are More Miserable in the Morning…You???? So which side is best????? From Quickies with Kell this morning on HOT-101’s AC & Kelly in the Morning…. The right side of the bed is the wrong side of the bed. Yeah, I’m into talking in riddles now. So what? According to a new survey, people who get off the bed on the right side are more likely to feel miserable, tired, and grumpy in the morning than people who get out of bed on the left side. People who get out on the left side feel like they’re awake an average of six minutes earlier . . . and their mood picks up an average of 15 minutes earlier. They’re also 7% less likely to have someone at work comment on how tired they look. The survey didn’t offer up any reason WHY people who wake up on the left side of the bed are happier, so it’s entirely possible this is a coincidence. But we’ll offer up a theory. People who sleep on the right side of their bodies are more likely to have heartburn and acid reflux, because it opens up the path between your stomach and esophagus which can throw off your stomach acid levels. So if you sleep on the right side of the bed, you might be more likely to sleep on your right SIDE . . . so that you’re not facing into the middle. And that could cause minor stomach issues that make you sleep worse. Ready for the Canfield Fair???? It’s just around the corner and great entertainment is already lined up! John Mellencamp! Sunday September 3rd……Tickets go on sale at TicketMaster this Friday at all TicketMaster locations. We’ll see you at the Canfield Fair! What Was the Most Popular Slang Term the Year You Were Born? AC & Kelly mentioned the list of the most popular terms for every year from 1926 to 2006. How many of these do we still use? How many have morphed into different meanings? The money-flush times of the Roaring Twenties gave rise to this term for a woman who is interested in a man, but only for his money. It came from the appropriately-titled “Mantrap” by Sinclair Lewis. It’s hooey, it’s balony. This word can be traced back to an article in The Saturday Evening Post, which referred to something phony as being a bunch of balony (their spelling). A couple of years after the “It Girl” came Hollywood’s “It Boy,” which referred to basically any handsome young guy. This word perfectly articulated the elegant-but-also-flashy style of Hollywood starlets and heartbreakers alike of the early part of this decade. The word “burp” almost replicates the noise one makes when belching. Nineteen thirty-three would be the year that Prohibition would be repealed, an occasion that was robustly celebrated. This could refer to your grandpa, or any older person you felt like insulting. This referred to, yes, the bingo halls that became a hot fad (and then a long-loved game). Another great word here, referring to something that’s pretty gross. Another entertainment industry term that made its way into common language, “fave” was used exactly how it is now: To refer to a favorite thing. Before we trash-talked, we engaged in bad-mouthing our opponents in sports. The rise of parenting experts lead to a whole new vocabulary for new parents. The term “baby blues” would refer to any sadness felt by a mother after the birth of her baby. Yet another phrase borrowed from Hollywood, this time to refer to a handsome actor. Though generally used for younger celebrities, we still think Cary Grant is a dreamboat. No longer considered a polite term these days, but this shortened version of “hyperactive” was used to describe kids with far too much energy. This one was a surprise! Though we associate “Duh” with the ’90s, it was widely used as an off-handed remark in the ’40s (OED cites a “Merrie Melodies” cartoon as the source). Interestingly, a “tag-along” was a military term that originally referred to a bomb. It was then repurposed into slang, to describe anyone who was unexpectedly joining in on your plans for the day. Another surprise from the ’40s! Before Homer Simpson had this catchphrase, this offhanded expression has roots in radio programs. Specifically, the program “It’s That Man Again.” Doh! We wonder if this was used ironically or not, but to be “cheesed off” is to be pretty angry about something. This is the also the year that “square” (as in, a very boring, out-of-date person) starts entering vocabularies, originating from the swing scene. Ah, the jet set! This gossip-column standby was first used in 1949 to describe young people who were living fast and glamorously. Hollywood lingo again goes mainstream with this very-appropriate term for the successful and gorgeous individuals who worked in the industry. An excellent word to describe a bar that wasn’t exactly fancy but was still comfortable, stemming from an article in The New Yorker. Though hippies defined the latter half of the ’60s, its use as slang predates the decade. A permutation of hipster, the hippie is described as “usually exotically dressed” and “given to the use of hallucinogenic drugs.” “Far out” also enters the lexicon here, as jazz lingo. The middle of nowhere, first cited to come from New Hampshire (and the people talking of backwoods areas). Not the first time it was used, but a Mad Magazine slang round-up of the year includes this timeless term. Sadly, James Dean, the king of cool, dies this year. In the era that gave rise to the “organization man” and “The Man in the Gray Flannel Suit” comes this corporate-ish term to describe a manager who just can’t let things go. This was a word that didn’t necessarily refer to a specific place, but the idea of a place. A place that was much cooler than wherever you were — though you could also describe things (like bands or records) as being “endsville” too. This phrase, which essentially means to show off, came over from ’50s California surf culture. The opposite of “Endsville” is “Dullsville,” of course. Need we say more? Baby boomers were becoming older kids and teens in this decade, which made this word always-appropriate. Sashaying over from the fashion industry is this oh-so-dramatic phrase, used to describe anything fabulous or gorgeous. To goof off, especially on the job, was to “Mickey Mouse.” It was a phrase that came over, somehow, from the military. Writer Tom Wolfe gifted culture with this term that describes someone who is feigning innocence. Thank you to GoodHousekeeping for the list. How Long Do You Go Without Washing Things Like Jeans, Bras, and Sheets? A new survey asked people how long they go between washing some things that, frankly, lots of us don’t wash very often. Here are the results . . .
1. Jeans. 10% of people wash their jeans every single time they wear them and 44% do it at least once a week . . . but 28% go at least a month, and 18% will hold out for months and only wash them once they get a stain. 2. Towels. 9% of people wash them after every use, which seems like ridiculous overkill. 43% of people wash them once a week . . . and 15% wash them whenever they get around to it. 3. Sheets. 44% wash them every one or two weeks . . . another 35% wash them once a month . . . but 21% use them indefinitely and only throw them in the laundry when they’re repulsive. 4. Bras. Only 5% wash them after every use . . . 56% go one or two weeks . . . and 33% wait until they SMELL WEIRD. Women are much more aggressive with their sports bras. 41% wash them after every use, and no one just lets them go indefinitely. 5. Underwear. 97% of people wash their underwear after they wear it once. 3% of people sometimes re-wear the same pair even if it’s dirty. From AC & Kelly this morning….How Many of These Weird Habits Do You Have? Do you ever wonder if other people share the same weird habits as you? Well we found an online survey about it. Here are eight questions we liked . . .
1. When you leave a store without buying anything, do you get worried they’ll think you’re shoplifting? 75% of people said yes. 2. When you write the word “Wednesday,” do you sound it out in your head as “Wed-ness-day”? 85% of us do it. 3. Do you pace around and fidget with stuff while you’re on the phone? 78% said yes. 4. Do you cringe when you hear a recording of your own voice? 82% said yes. 5. Do you ever worry other people are judging you for how fast your windshield wipers are going in light rain? 52% say yes. 6. When you’re reading a book, do you ever space out . . . read a whole page . . . and then not remember any of it? 97% say yes. 7. Do you ever close Facebook or Twitter because you’re bored with it . . . then open it back up one second later without thinking? 93% say yes. 8. Do you ever respond to your pet by saying, “I know” after they bark or meow? 83% of us do it. From Quickies with Kell this morning…. What Does the Color of Your Car Say About Your Personality? Can people tell what kind of person you are, just by the color of your car? Probably not. But a recent survey found out what other people THINK it says about you. Here are six car colors, and what people think they say about your personality . . .
1. A black car makes you seem charming, intelligent, and ambitious. But also selfish. 2. White or silver makes you seem trustworthy. 3. Red makes you seem happy and adventurous, but also angry. 4. Blue makes you seem loyal, kind, and considerate. 5. Tan or brown makes people think you’re grumpy, mean, and boring. 6. A gold car makes you seem greedy and wealthy. Obviously it has to be an expensive car though. Even if it’s gold, people won’t think you’re rich if you’re driving a 1998 Ford Focus. The survey also found men think women in red cars are the sexiest, and women think blue cars are the most attractive for men. The least attractive car color is brown. The Newest Photo Making People Crazy: Are These Strawberries Red? It’s been two years since that blue-black-white-gold DRESS blew up online. There have been TONS of confusing “What color is this?” photos that have gone viral since then, and here’s the latest. A new photo is going around that shows a bowl of strawberries and it asks a simple question: Are they red? The correct answer is no. All reds have allegedly been stripped out of the picture, so it’s all different grays. But we THINK they’re red and we see red, because they’re strawberries. We’re confused. Romantic Ideas for everyday that won’t break the bank! As the months and years pass by in the relationship you may start to take each other for granted or start to believe that excessive shows of affection in love is just corny. Create little ways to remind your lover that you’re still in love with them. Love is more about bringing a smile on each other’s faces for no reason at all….And love is more about letting your partner know you’re still in love with little affectionate gestures. Write little love notes and slip it into your lover’s pocket even if it’s just a little “I love you”. These notes don’t have to be elaborate. Even a little lipstick mark on a piece of paper will bring the same smile! Whisper a message in your partner’s voicemail and say something naughty in the middle of the day. Record a love message on your partner’s phone. Set an alarm for a time when you’re not around them with a message saying “check your recorder app/voice recorder”. It’s a HOT101 Free Music Monday…..
More tickets to Twenty One Pilots @ Consol Energy Center this Friday…PLUS Tickets to the Harlem Globetrotters at the Covelli Center this Friday. At 7:15am we have a pair of tickets for TwentyOne Pilots at the Consol Energy Center in Pittsburgh this Friday 1/27/17. Cue to call with AC & Kelly. Wow! This takes more than courage….